The Elder Scrolls V: Skyrim: Special Edition (Xbox One/PS4, 2016) – Review – Stuff and That. Aaaaaaaaaaaaaah. I don’t care if this review is bad, I mean, it probably will be, as per, but I don’t care now. This article, while taking the form of a review, is me burying this game behind me before it consumes ALL MY TIME. The fact that I first played it seven years ago is irrelevant, it still holds up and remains probably the most addictive game I’ve encountered. I mean, even now I’ve drained everything I can from it for now, I’ll still go back to it in a few months because it’s just that good. However, you’ve had everyone and their grandma telling you how good Skyrim is; YOU’ve probably played it and loved it as much as I have. So, what’s the point in me reviewing it? I dunno, have some words! If you don’t know, The Elder Scrolls series has, along with Fallout, been developer Bethesda’s flagship series for over 20 years now, with each instalment improving on the last. 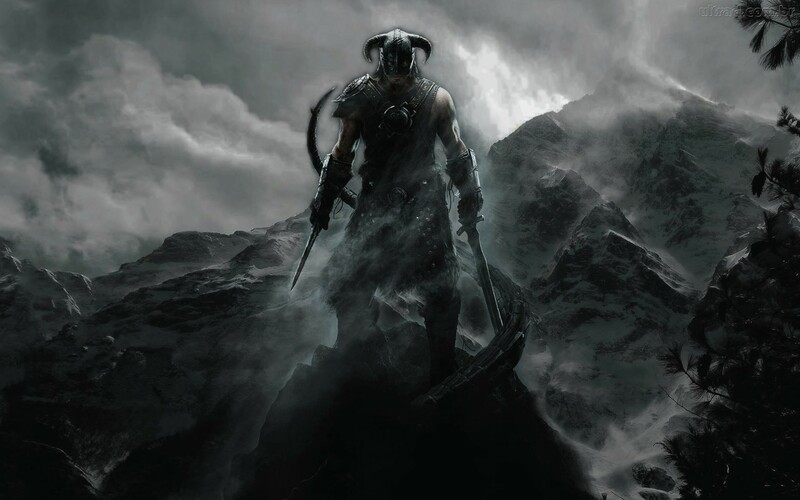 If you don’t count Elder Scrolls Online (WHICH WE DON’T), Skyrim is latest in this series and, when it was initially released in 2011, blew every gamer and critic away with its ridiculously expansive gameplay and meticulously detailed world. Now, five years, three DLCs and entire game (THOUGH WE DON’T COUNT IT) later, Bethesda have re-released their masterpiece, with some nice little goodies to boot. As you’ll expect from Bethesda at this point, y’all know they can do an RPG right. If you need proof, this is it. From the minute you step off of that execution waggon and customise your character (which is a task upon itself), you are fully immersed in this world and you really feel it. You are *insert name here* (I went for Dinguus The Bastardbreaker, personally), or the Dragonborn, and, as dragons have returned to Skyrim after being banished to the Elder Scrolls, it’s up to you to wipe them suckas out. A basic plot, on the face of it, sure, but then you get into the lore of the game. And you will, as well, I’m not usually one for backstory and crap in my games, but I was spewing crap about “eras” and “high kings” like a pro by the time I was finished. The many stories weaved in Skyrim are so detailed and well-crafted, though my favourite is still The Lusty Argonian Maid. Needless to say, however, when you play Skyrim, you’re in Skyrim. Obviously, it helps that Skyrim itself is such a large and rich world to play in. You’ll be spending very little time in the main story when you’ve got bucketloads of side quests and errands to run. It greatly increases the replayability of the game and means that I’ll still be going back to this game in years to come when I get bored of whatever I play next. With nine holds, and different environments behind every corner, it’s fair to say, there’s a lot to explore in this game. One minute you’ll be climbing snowy peaks, the next you’ll be traversing through thick forests. Every area has a bounty of different enemies to butcher on your way through, whether it be big bastards like giants or flippin’ dragons, or more manageable suckas like bandits or dreaded Frostbite Spiders, whom I hate. There’s no lack of action here, meaning you’ll have to save often. Indeed, there’s sadly no autosave here, meaning you better get back in the habit like it’s 2002 again. I honestly don’t know why the developer insists on not having this de-facto standard in their games; it causes many a profanity-laden speech at the television. 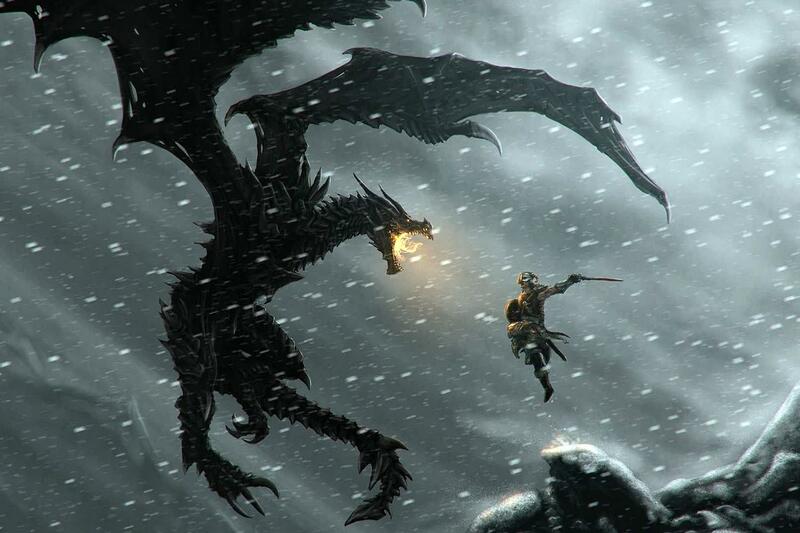 The action does come thick and fast in Skyrim, though, and it means that no playthrough will be boring. Whether you’re trekking through a dungeon or a forest, there’s gonna be something there that wants to kill you. At first, this seems like a daunting thing to jump into; you’re level one and your most valuable asset is some hide armour you forged in the tutorial. “Oh crap”, you think, “I’m buggered”. No fear, compadre, Skyrim’s levelling system is one of the most accomplished yet easy-to-use in the genre, something that I perceive as a godsend, being an overall pleb. It’s this levelling system that will see you become an almighty f*ckgod, slaying both dragons and pussay by the end of the game. Don’t get it twisted, though, the journey to get there ain’t easy, and you will spend a lot of your time running away from things you’ll later pummel. What puts Skyrim above the rest in this area, however, is how evenly balanced it is. You progress just at the right rate, not so fast that it becomes boring, but not so slow that you become disheartened. It’s something difficult to do done really well. When you inevitably do get jumped by some bandits looking for cash or a troll looking for a snack, you have plenty of weapons at your disposal. Unlike many other games in the genre, you’re not restricted by classes. In fact, you’re not restricted at all. You can choose to go for the barbarian-style “hit all the things with a big stick” approach, or you can study magic and set sh*t on fire. However, you’ll always have everything available to you, so you can swing a phat mace with one hand and shoot lightning from the other, making fights a lot of fun, initially. While it does get easier the further on you go, you get to a point in the game when the fighting begins to get a bit tedious, like you’re fighting the same fights every time. It’s all polished and well done, don’t get me wrong, but it’s this lack of variety that caused me to turn off when I did. However, it ain’t all fighting in this game, there are a variety of other things you can get up to. Something which is expanded upon in the Hearthfire DLC (which we’ll get to later), you can buy property and set up a house in a city of your choice, once you’ve gained the Jarl’s favour. This enables you to store all the crap you’ve gathered on your journies, as well as become a part of a community you begin to feel strangely attached to. You’re also able to craft and improve weapons at a blacksmith, on top of creating potions and enchanting these weapons. It’s these little details that make Skyrim so immersive. When it was first released back in 2011, Skyrim was considered a pretty looking game. Sure, it wasn’t state-of-the-art at the time, but it was massive, and you can’t have both, you ungrateful little sh*t. Only joking! Because now you can! Yes, while they didn’t do a complete graphics overhaul, Skyrim: Special Edition looks objectively superior to its predecessor, the colours and textures are generally richer, and the detail going into the intricacies is that much more… intricate. The day/night cycle is really effective, showing different sides to the landscape. The forests have an aura of the supernatural not found during the day and, alternatively, the cities are busier than they are at night, with shops having proper closing and opening times. Plus, if all o’ this ain’t enough for ya, there are mods galore that DO completely overhaul the graphics, bringing them up to the photorealistic standards of something like Phantom Pain. It’s stunning. The overall sense of grandeur felt in your adventure is heightened by the soundtrack that accompanies you. Everyone knows that opening score, don’t we? I mean, it’s the definition of the word “epic”. In some ways, I’d go as far to say more so than the score from Lord of the Rings. Yeah, I just said that. But the battle chants, the pounding drums, uuuuhhhhhh. Everything about it makes me prime and ready to kick some scaly arse. However, it ain’t all bad, as Skyrim: Special Edition also includes all three of the DLCs released for Skyrim: Dawnguard, Hearthfire & Dragonborn. Dawnguard, in my opinion, the weakest of the three, is a story expansion that pits you against vampires, also allowing you to become one in the process. While the addition of vampires as an enemy type is a welcome one, I found the story itself to not be as fleshed out as those in the main campaign, as well as a bit out-of-place in the Nordic culture of the game. In some respects, Hearthfire could be my favourite. This DLC allowed you to expand on the more domestic aspects of the game, opening up the option to actually build your own house, as well as adopt children. While I didn’t have the patience to build a house, opting for the perfectly nice one in Whiterun, I did adopt the little orphan girl that sits outside the tree in the square, which I found to be a nice touch when I returned home from my adventures. Finally, my actual favourite of the three is Dragonborn. This is a story expansion if I ever saw one. Opening up an entirely new island, Solstheim, for exploration, which, in itself, is steeped in its own lore, I spent almost just as much time here as I did in Skyrim itself. While there are many different side quests and stuff, the main bulk of the DLC is an adventure where you must defeat an all-powerful dragon priest, as well as a daedric prince, and you do so by RIDING A MOTHERF*CKING DRAGON, BOI. That aside, it really was one of the best DLCs I’ve experienced in a damn while. Overall, Skyrim is a masterpiece of games in general. Is it worth buying again for twice the price? Probably, but not for the reasons you think. The main selling point for me was the chance to experience Skyrim again, a game which I loved from the beginning due to its completely immersive world and amazing storytelling. It also includes three great DLCs, so you’re definitely getting value-for-money. However, the whole mod debacle was extremely disappointing and the issue with the lack of autosave is very frustrating at times. All of that being taken into account though, Skyrim is still a masterpiece, and is close to flawless. An excellent post regarding something about which I know nothing (except having read this, now I kinda do)! So, I’m an old fogey and I don’t play video games (largely because I don’t have a player or a TV either, nor do I often have the time – I’m too busy jamming tunes!). I can appreciate the graphics, and the amount of thought and work that goes into something like this, though. Cool beans! Thanks man! I do love me some video games. It’s just a shame I don’t get to write about them as much as I’d like to because I’m so slow with em! It’s good that you take your time with them. You get more out of that way, I think! If you like gaming, may I also recommend the excellent work of Sarca at Caughtmegaming. She’s awesome, and may have covered some stuff you’d enjoy! Ooh thanks man! I love checking out new blogs, I’ll give her a look! Right on. Sarca’s a long-standing member of our Community here. Enjoy!